On this week’s show “Knock On Wood”. my conversation with Eric Herman from State of the Art Wood Floor Gallery. Eric and I will discuss aesthetic value of wood flooring. The enormous array of styles, finishes and qualities available today. We will discuss proper home environmental conditions. Engineered wood flooring vs. Solid wood flooring. Eric is an expert on the state of the art in wood flooring and I am anxious to discuss with him all about it. David begins with the story of why he often knocks on wood at the beginning of a design project. He introduces tonight’s topic of wood flooring. David then traces the history and development of wood flooring throughout American history. Eric Herman shares how he sees beauty in his family and he sees beauty in the comfort his home affords him. Eric describes working in New York and how engineered floors have become state of the art in the industry. Eric notes the various techniques used to create unique and lasting flooring. David and Eric describe the technical details of engineered flooring and how it varies from traditional wood flooring. They offer tips on how to make flooring design choices based on your preferences and budget. David and Eric continue their conversation with the topic of subflooring. Eric discusses the environmental conditions within homes and how wood flooring can be affected by its environment. Eric notes how relative humidity can affect the wood flooring. Eric offers guidelines for what finishes work best in highly trafficked areas of your home or business. David and Eric take questions from the listeners in tonight’s final segment. They break down the cost differences between carpeting and wood flooring. David and Eric describes the costs and benefits of using wood flooring in your home. Eric notes the social concerns and how companies ensure that wood is harvested correctly without causing environmental damage. On this week’s Show “And So To Bed” My conversation with Gayle Hoffman from Yves Delorme Paris. Gayle is an expert on all things bedding, including luxurious sheets, towels, pillows, comforters and all the proper ways to sleep well. We will discuss Yves Delorme’s internationally known bedding fashion and like all the great Parisian Fashion Houses how they set the stage and the trend for bedroom design and style to come. I’m anxious to discuss the design process, the artistry of their patterns, color and quality. And so to bed we shall go!! David begins tonight discussing the love he has for his bed at home. He muses about the importance of sleep in our lives and why we should give the bedroom the design priority it deserves. David notes how clients often leave the bedroom for last in design projects. He shares some tips for designing the key elements to a comfortable bed. David welcomes Gayle and asks her about beauty. Gayle defines beauty as what inspires her senses. Gayle describes the attention to detail and sensibility she sees in Yves Delorme’s work. They discuss how Yves Delorme designs pattern by season to speak to their clients in over 71 countries. Gayle notes what sets Yves Delorme apart as an international company that still maintains its family owned and quality first identity. David and Gayle continue their conversation by exploring how bedmaking is a personal decision.They offer advice on how to decide what pillows best fit your comfort needs. They describe what to consider beyond just thread count when choosing sheets. Gayle and David describe how Yves Delorme has a goal to create a lifestyle within the home. They encourage listeners to take a similar approach to designing their homes. David and Gayle take listeners questions. They give recommendation about colors that work well when designing a bedroom.They explain textures and how to layer when making bedding choices. They advise on how to make sheets last longer and to avoid over-drying. They also note how to purchase new patterns and build on current sheet patterns instead of using the same sheets repeatedly. On this week’s show, The Devils In The Details, my conversation with Bob Sherman from the High End Construction Firm – C Square Contracting. Bob and I will discuss custom home building and renovation! I am anxious to talk with Bob about proper preparation; defining in advance challenges and difficulties facing the design team and the client. He has an innate ability for creative problem solving throughout the home building process. And because of Bob’s and C Squares’s years of experience and know how we will discuss, the ever present list of details – the thousands of small details that define the character of the home. David begins the show mentioning the big picture and how he visualizes homes when working on a new project. He notes how interior designers set the visual agenda and determine the style path in newly constructed homes or apartments. He tells how details are critical to any design project. He muses not only about the challenges in the details; but also how the details are where the home emerges to express and define itself. Bob Sherman joins the show and begins by sharing how he sees beauty in simplicity. He notes how he was inspired by Frank Lloyd Wright and how he applied his simple approach to his own home. David and Bob discuss the importance of a qualified contractor in design projects. Bob tells how thorough planning facilitates successful projects. Bob lists key characteristics that help develop trust between contractors and clients. Bob and David elucidate the importance of collaboration between designers and contractors. Bob reiterates how planning helps prevent difficulties when working on a project. They discuss some of the challenges they face working in New York City and how they create solutions for their clients. Bob mentions the importance of honesty and open communication in maintaining good client relations especially when unexpected problems arise. David and Bob take questions from the listeners in tonight’s final segment. The first question explores blackout shades and how to incorporate them in a home. David and Bob agree that referrals from a satisfied client are key to their business. They reiterate how contractors and designers should be punctual, communicative, and responsive to build client relationships. Bob breaks down what goes into a contractor’s punch list. David introduces tonight’s topic: glass and how we can use it within our homes. David discusses the metaphor of a glass house to show how glass offers beautiful transparency. He mentions the history of glass in architecture. He notes that transparency in a home can illuminate the interior and how glass can create a flow of light throughout a space. David is joined by Daniel Stewart. Daniel shares how he finds beauty in his bed, in how it exudes both feminine and masculine energies. Daniel describes the process of how glass is laminated to prevent shattering in architectural design. Daniel shares how color and texture contribute to the possibilities available when working with glass. Daniel explains the various ways glass has been used in his past projects. David and Daniel discuss the new technologies available working with glass. Daniel describes a Texas bar project where they used chicken wire glass as an example of the seemingly endless possibilities when using glass in design projects. They touch on different ways glass can be used to optimize design in a space. David and Daniel take questions from the listeners. Daniel responds to the first question by explaining how to manage the amount of sunlight coming in via large windows. The second question deals with the differing thickness in glass and how best to use glass when remodeling cabinets. On this week’s show “Simply Elegant” my conversation with Lighting Designer David Burya, principal at Tirschwell and Co the leading Architectural Lighting Design company throughout the world. David and I will discuss the elegance of Interior lighting from programming, comprehensive plan making and fixture selections to lighting philosophies and environment aesthetics. David begins tonight’s show exploring the meaning of elegance. David wonders aloud whether elegance has become harder to come by in our time. He traces how his definition of elegance has changed to mean subtle, appropriate, authentic, and graceful. He notes how technology has allowed us to insert elegance into our homes in the way we design our lighting. David T. and David B. being their conversation with their ideas of beauty. David B. finds beauty in simple and appropriate aesthetics. David B. stresses the importance of light and lighting’s potential to evoke emotions. He describes how elegant lighting is a balance and strength and ease. David B. further explains how elegant lighting helps you to focus on the environment of a space rather than simply the light fixtures. David B. recounts some of his most notable projects for residential and commercial spaces. He details his collaborative process working with architects to ensure his lighting design matches the vision for the space. David B. notes the importance of collaboration, pragmatism, and listening when working to optimize the lighting design to match a client’s vision. They touch on how LED technology offers more options for lighting choices. David and David take questions from the listeners in the show’s final segment. David B. touches on the ways he works with clients to determine what emotions to evoke with a lighting design and how he advises clients on what is appropriate for a space. They consider the use of colored light and when colored light bulbs could work within a home. 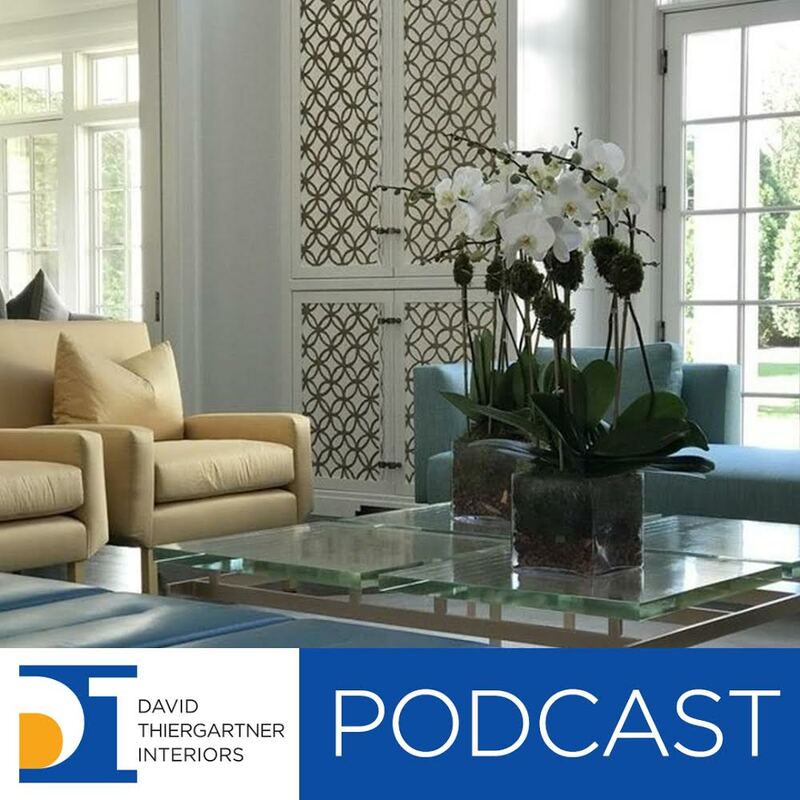 On this week’s show, my conversation with Interior Designer Bachman Brown. Bachman has been featured in the New York Times and Traditional Homes. I want to explore the power of dreams in the design process and the role of the Interior Designer in making their clients dreams come true! David starts off the show talking about his dreams that and how most of them in life have come true. He also mentions that dreaming helps with his creativity when it comes to interior designing and that he loves making the clients dreams come true, putting down the belief that no dream is too big. He introduces interior designer, Bachman Brown. Like David, Bachman loves to turn dreams into a reality. Bachman Brown joins the show. He thinks that without authenticity, there is no beauty and that beauty comes in all shapes and sizes, including his library where he can’t stop looking through his books. Bachman has always been dreaming, especially when he was young and acting out all of his dreams long before becoming an interior designer. He and David talk about dreaming big and how achieving goals step-by-step and being creative can change the thinking of a designer and, ultimately, the lives of clients. David continues his conversation with Bachman Brown. The guys talk about Bachman’s beginnings as a young designer, including his first job as an assistant to another designer, to his first big project, and finally opening his business. Bachman mentions that he loves his career and still connects very well with his clients. He doesn’t have a particular style, as most of his work is different with every client. Plus, he and David have one thing in common, they both enjoy working on the design sketches for houses. Then, a discussion about books and films. How can reading or watching movies also influence the work of an interior designer? David and Bachman take questions from listeners. First we find out, how did Bachman get his first name? Also, the guys talk more about dreams, visualizing before putting designs on paper, imagination and figuring out what is beautiful to you, and can seeing things with the inner eye be natural or self-taught? This show “Seeing Red”, is a show entirely dedicated to the color Red. The first in our series of December Christmas Design Shows I have color expert and color consultant Betsy Karp to talk all about it. Seeing Red – The color that is so much apart of all of us. The color that protects us. That symbolizes courage and power, that fills our hearts with love and our minds with passion. We are going to talk about the history of red at Christmas time including why Santa’s suit is red, and why Rudolph has a red nose. I explore using red inside our homes. Why red rooms are challenging and worthy of thoughtful consideration. Listen live tonight, perhaps with a glass of red wine or a piece of red velvet cake. My conversation with Darin Ronning and Travis Messinger from Bantam Tileworks. Handcrafted tiles and myriad of colors makes Bantam Tile Works a unique and sought after company. I want to explore the techniques that give each and every tile it own unique quality. I want to hear all about the sensational range of available colors inspired by Louis Comfort Tiffany!